Australia’s most prestigious sprint race will see a strong field storm down Flemington’s straight six for a shot at $1 million. Join The Roar from 2.45pm AEDT for a full preview, live blog and post-race analysis. 15 premier sprinters will line up with an interesting mix of Group 1 winners and up-and-comers battling it out. 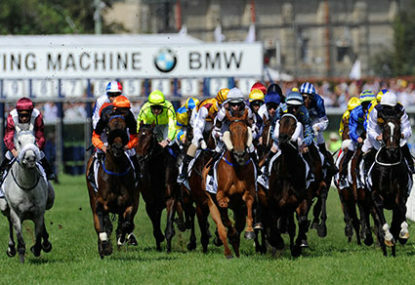 Run over 1200m under handicap conditions, the race has proven in the past as one which can be won by any in the field. An interesting battle on the bookie boards for favouritism is being fought between Shamexpress, Samaready and Lankan Rupee. Shamexpress won this race last year when he carried 51kg. Assigned 56kg here, he has come in with an excellent winning chance considering he won it last year as a three-year-old. The O’Reilly entire has been in excellent form since returning from England and runs better at Flemington than anywhere else in the country. Running luckless in the Group 1 VRC Sprint Classic to finish second and then finishing strongly to run second behind Snitzerland in the Lightning Stakes, Shamexpress’ lack of a Group 1 victory has enabled him to enter today with an excellent weight and winning chance. Lankan Rupee has been a revelation since being gelded. Winning the Group 1 Oakleigh Plate a fortnight ago, this field looks stronger than what he faced but the fact that he won the Oakleigh by almost four lengths cannot be ignored. The one issue facing punters will be how well he can handle straight racing because his biggest wins to date have come at Caulfield. Samaready will also be fancied after a good run in the Lightning where she pulled early and didn’t get going until late yet still finished third. We haven’t seen the same turn of foot she showed at in the Moir Stakes when she put four lengths on Buffering but her first-up run was full of merit to suggest she’s not too far off it. It’s quite difficult to understand how Moment Of Change opened at double figure odds after winning back-to-back Group 1s with the Orr Stakes and Futurity Stakes now under his belt. As the likely leader, Moment Of Change will take some catching and so far, no horse has been able to all season. In spring, he was Group 1 placed behind Buffering twice and presents some excellent value if he stays at double figures. He’s been assigned top weight but stepping down in distance, it shouldn’t be too much of a problem for him. Drawing form from the Oakleigh Plate, Knoydart was the only sprinter in the field that was closing on Lankan Rupee so he’ll appreciate the minor step up in distance here while Spirit Of Boom ran second in that race. Pago Rock was very impressive last week when he carried top weight and finished second behind Adamantium over 1000m and closing the gap with every stride. As honest as they come, he could be one worth considering for exotics. One of the biggest mysteries in the race surrounds Bernabeu who will carry just 50kg. He failed to fire a shot in the Lightning but he has had two trials at Flemington this season and looked a million dollars in both. If he still has something left in the tank after those trials, he could easily win this in the same way Shamexpress did last year. World class straight racing is something unique to Flemington and we’re set for a cracking Newmarket when it jumps at 3.20pm AEST.